Nikola Tesla: Eccentric Inventor or Celibate Bachelor? Nikola Tesla. Inventor? Engineer? Dashing public figure? All valid in their own respects, but he was also a bachelor to the bitter end. Although Tesla pioneered many breakthroughs in electromagnetism, his strange ways sparked great public interest. Could these peculiar eccentrics have been the result of his lack of a loving wife and family? Tesla was born in 1856 in modern day Croatia, the fourth out of five children to an Orthodox priest and a household appliance inventor. His father had hoped for him to become a priest, but a teenage bout of cholera led him to pursuing science and technology instead. The young Tesla immigrated to America in 1884, where he would remain until his death in 1943. Nikola’s appearance was described as “striking” by American inventor, Hugo Gernsback. 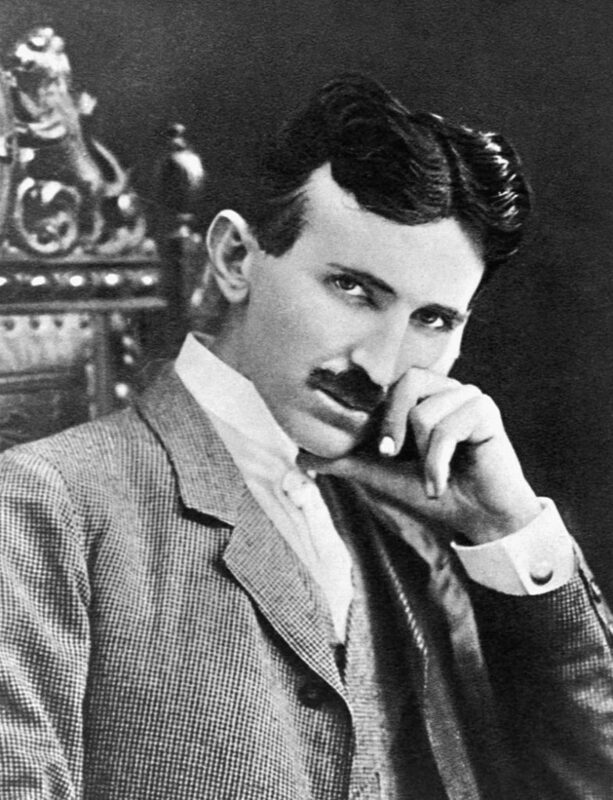 At over six feet in height with smouldering, dark eyes, Tesla was a sight to behold. He exuded an air of confidence, and remained quite popular with women. However, Tesla never developed any meaningful relations with any women outside his immediate family. What a waste! A popular theory for Tesla’s celibacy throughout his life was his bizarre phobias. Following his experience with cholera, Nikola soon developed a fear of germs. This likely contributed to his aversion to interpersonal relationships. Even stranger was his discomfort surrounding women’s earrings. Tesla could not bear to speak to a woman wearing such ornaments, especially in the case of pearls. Although Tesla had some difficulty forging relationships with fellow humans, he maintained a rather intimate connection with a female pigeon. Tesla is quoted to have said: “This pigeon was the joy of my life, I loved her as a man loves a woman. If she needed me, nothing else mattered. As long as I had her, I had my life goal”. When his beloved pigeon passed away in 1922, Tesla declared that his life’s work had concluded. Though Tesla lived out his last years nearly forgotten in the public eye, his impact is felt to this day. From inventing the now industry standard AC (alternating current) motor to enabling the wireless transmission of electrical energy, Nikola Tesla’s contributions remain hard-felt throughout modern society. He eventually died penniless and isolated in 1943, discovered by hotel cleaning staff. Nevertheless, he remains a household name to this day. He is immortalized in the SI unit for magnetic field strength, and the world’s most prominent electric car company bears his name. I wanted to do the reverse Finkbeiner challenge to observe the discrepancies between describing male and female figures in STEM. It was interesting to focus on a male scientist’s personal life, instead of his contributions to society. Lastly, I chose Nikola Tesla because I enjoyed learning about electromagnetism at school. This is a great post. Good job at reversing the Finkbeiner rules.